Are your kids itching to go out and explore? 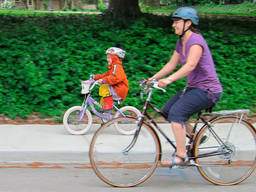 Bike riding is a great pastime for kids who love to get active. Bike Riding is one of the most enjoyable, leisurely activities in New Zealand and can be experienced in many sports centres. Whether it be indoor or outdoor cycling, children will surely enjoy the ride! Let your kids take time to exercise their navigation skills or appreciate the little things; the warmth of the sun, the green grasses, the cheerful, chirping sound of birds and more! Stroll around the relaxed way and let them ride their bikes on track-friendly bike centres! Kids go bike riding with small and big bikes. Why are bike centres great places for your kids? Cycling is one of the most enjoyable activities for kids today and bike centres or sport centres are great locations to let your kids have the freedom to wander around without having to worry constantly where exactly they are. Bike centres are not only limited to bike riding activities. As a matter of fact, bike centres offer a wide array of outdoor activities. In outdoor sports centres, there are parks to enjoy the scenery. Plus you and your kids can also play other sports like Frisbee! Here you can also find various souvenir shops and food stalls your children will surely enjoy. And what are bike centres without bicycle shops? Here, you can find necessary cycling gear and different types of bikes for cycling, and even mountain biking! Also if you want an intimate bonding time with the family, picnic areas are also available where the whole family can enjoy altogether. Bike centres for kids vary in lengths, so always make sure that you get acquainted first with the terrain of bike centres for a more fun-filled ride. If you're not too confident in letting your toddlers wander around, you can always try bike riding in an indoor sports centre where they offer a different kind of cycling experience for your youngsters! It is always the best decision to stick to off-road paths in bike centres. However, children still have to obey the safety rules of bike paths, which includes, properly wearing kids helmets, properly using their bells to signal pedestrians and other, more experienced cyclists on cycling tracks. It is also important to check the bike's condition beforehand, including the air pressure in the tyres and the brakes when you go to bike centres. Start bike riding with your kids now at bike centres! There are numerous bike centres and cycling paths in New Zealand that will gladly accommodate interested families. If you've just started learning about cycling, here are some of the great tracks around New Zealand you can try and visit. Go and get your bikes ready and watch your kids take off to wonderful places and experience fun and excitement offered at bike centres! Visit our ActiveActivities directory for more information on Bike centres for kids in New Zealand, as well as other kids activities that your toddlers will enjoy!